Born in Porto, Portugal, in 1950. Received his Bachelor’s degree in Letters from the University of Coimbra, and finished his Ph.D. in Communication Sciences (Major: Semiotics) at the Universidade Nova, Lisbon. Has taught and done research in several national and international universities: Faculty of Letters of the University of Porto, University of Paris X (Nanterre), University of Siena (Italy), University Louis Pasteur (Strasbourg). At the University of Strasbourg developed with Abraham Moles a research project in the area of computer generated art. 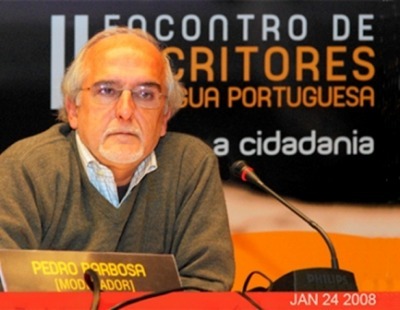 He is the founder, at Fernando Pessoa University, of CETIC-Centro de Estudos de Texto Informático e Ciberliteratura (Centre of Cyberliterature Studies). Former full Professor at the Escola Superior de Música e Artes do Espectáculo (Faculty of Music and Performance Arts-ESMAE/IPP), invited professor at Universidade Fernando Pessoa (Porto), and invited member and consultant of the following Research Centers: Centro de Comunicação e Linguagens (Centre of Communication and Languages Studies, Universidade Nova, Lisbon -CECL); Centro Transdisciplinar de Estudos da Consciência (Centre of Transdisciplinary Conscienceness Studies -CTEC) and Centro de Texto Informático e Ciberliteratura (Centre of Cyberliterature and Informatic Text Studies -CETIC), both at Fernando Pessoa University (Portugal); Núcleo de Pesquisa em Hipermídia (Hypermedia Studies Unit -NUPH) at PUC-Sao Paulo (Brazil); and Centre de Recherches sur les Textes Électroniques Littéraires (Centre of Electronic Literary Texts Studies -CERTEL), at the University of Artois (France). Add new creative work or critical writing.